Mars inhabitants no longer just play golf, boat & road bike around town- they shop, practice yoga & take drives to a picturesque lighthouses & botanical gardens. Venus folk also have upped their game by branching out from shopping to attending beer tastings, kayaking and perfecting the fine art of fly tying. Get out of your world and play in ours! It is in that spirit that we offer couples time in Freeport to enjoy all their interests and more! This package is designed so that everyone can come and enjoy themselves thoroughly! You intrepid shoppers don’t need help from us, but we’ll throw in a $50 LL Bean gift certificate to get you started. 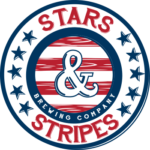 For you Mars characters, we can get you slot at the Bhavana Day Spas daily yoga classes just a few doors down while the Venuses visit the recently opened Stars & Stripes Brewing on Lower Main Street. Both of you can enjoy a myriad LL Bean Outdoor Adventure School adventures and equally tantalizing services at Bhavana. Give us a call with your interest and we’ll tailor your experience for you! Take a quick look at our other specials and our blog to get an idea of the range of exciting things we can put together. On returning, how about a reunion bottle of wine and a great dinner in town? Depending on the activity you choose, packages start as low as $558 off peak season (plus tax)! We’d be happy to help you put this together, so please call or book TODAY! Grab your Girls and learn all you knead to know about dough, sauce basics, cheese basics and overall technique before topping with your fresh ingredients and baking to perfection. No pizzeria-style oven required. The result is unbelievable pizzas from scratch, that you’ll create and enjoy eating “Inn our Kitchen” for a hands-on experience. Pair your artisanal pizza with our selections of craft beer and wine, which are available for sale. 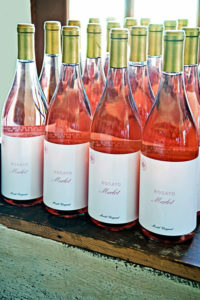 Our favorite Rose from Channing Daughters will be available by the glass for all to enjoy. Leave our cooking class with the skills and knowledge needed to make great pizza in your own home! *Saturday, June 2nd: Pizza from Scratch 6p-8p $50 pp; $85 per couple (**Free with 2 night stay); Alcoholic Beverages not included. PERFECT MAINE ADVENTURE, LAND & SEA! This could be as little as 3 days on each, or as much as 6 days on each, or any combination that will fit our respective schedules and occupancy opportunities. Call Brewster House for more information, but a look at their video https://www.youtube.com/watch?v=vKBjprcNDjI&feature=player_embedded (and ours on this website) will certainly entice you! 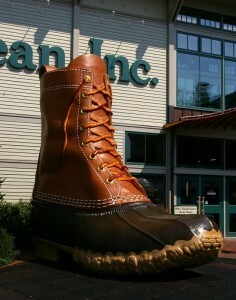 Posted in | Comments Off on PERFECT MAINE ADVENTURE, LAND & SEA! Your Maine Seafarer Adventure includes two nights in one of our deluxe king or queen guest rooms, where you will receive a nautical-themed gift basket. Wake to fabulous breakfasts each morning, as well as afternoon refreshments. Sail Casco Bay on a historic, Maine-built schooner, and learn about Maine’s maritime history with admission for two at Maine Maritime Museum . Relax with dinner at Azure Cafe ($50 gift certificate included), to complete your memory-making voyage. If you have time, visit some of the area lighthouses and harbors (maps and directions provided). Your vacation of a lifetime! Double occupancy, king or queen room, from $610 + tax. 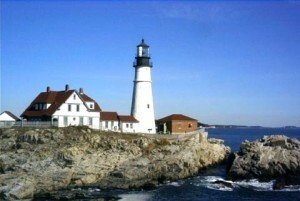 Other rates are available for suites (Portland Head or Bass Harbor). 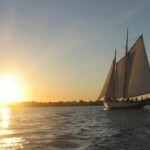 Sail on a Windjammer and stay at Brewster House Bed & Breakfast for your Maine Vacation Adventure. This romantic visit for two to Brewster House B&B on the Maine Coast, is the trip of a lifetime! You’ll be pampered with a romantic queen room (with huge private bath, of course! ), a sailing-themed Maine welcome basket – but that’s just the beginning. Two nights at Brewster House, with our fabulous full, hot breakfast each morning, prepares you for a day of adventure and breathtaking beauty along the Maine coast. 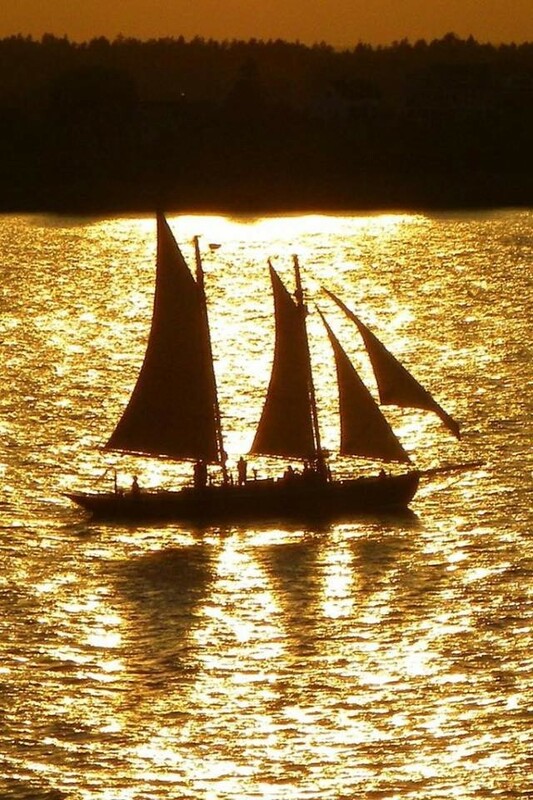 Your stay also includes a sunset sail for two aboard a schooner. 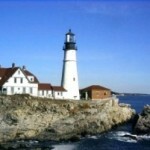 View the famous Portland Head Lighthouse from the water, and sail magnificent Casco Bay. We’ll also provide maps to other area lighthouses if you’d like to visit them while you are here. Return for a $100 shopping spree at L.L. Bean’s world headquarters and five stores, and a $50 gift certificate for a romantic dinner at Azure Cafe. 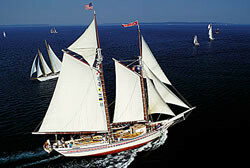 Lodging (double occupancy), schooner cruise for two, gift certificates and taxes from $684. Other rates available for more than two people in the Bass Harbor Suite or Portland Head Suite. Sunset sails subject to weather and availability. Your Lighthouse Tour Special includes a two night stay in one of the romantic queen rooms at Brewster House (only a short walk to L.L. 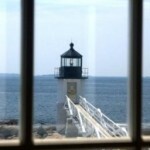 Bean and Freeport’s many shops), then add an extensive lighthouse driving tour along Maine’s spectacular coast. 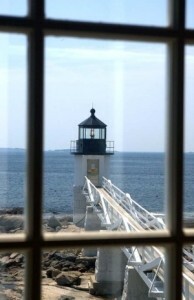 Visit as many of our picturesque lighthouses as time permits! Take home your own copy of a lighthouse guidebook to enhance your tour. Allow plenty of time, as you can easily spend more than a day on the driving tour. Includes a $50 gas card to help with some of the transportation costs, a $50 restaurant gift card at Azure Cafe, and a lighthouse-themed Maine welcome basket round out this special. New! 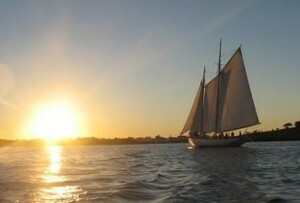 Add a two-hour cruise of Casco Bay on an antique schooner for only $40 per person! 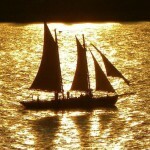 Please let us know when booking that you would like to add the schooner cruise. Double occupancy king or queen rate, including taxes, starting at just $558 + tax. Schooner cruise is additional. Rates for our suites are available on request. Stay N’Play Golf & spend two relaxing nights at Brewster House in one of our luxurious queen rooms and your own large private bath, and spend a relaxing day enjoying the Maine outdoors with you own cart at Bath Country Club’s prestige 18 hole golf course! You’ll start the morning with our fresh ground coffee and delicious three course gourmet breakfast. Come back to a rock on the porch and share a bottle of one of our fine wines, then it’s out on the town with a $50 gift certificate to the Azure Café, here in Freeport. Better yet, bring your best golf buddies to share with!! Celebrate your birthday special day, or anniversary special day, with a two-night visit to Brewster House for your romantic package. Relax in your immaculate room in this enchanting Victorian home. Unwind with day trips to see nearby lighthouses, coastal beaches and hidden villages. Enjoy dining at restaurants from lobster pounds to four star establishments, and shopping at over 160 shops within only a few blocks of Brewster House. Two nights accommodations at Brewster House with full hot breakfasts each morning, afternoon refreshments, and helpful hosts who can provide ideas and directions. Discounted gift certificates may not be used with the birthday special or anniversary special romantic packages. Specials and discounts do not apply to packages. Offered pricing assumes direct reservation with Brewster House and will be slightly higher when having booked through a booking engine such as Bed & Breakfast.com, Booking.com or their affiliates. Relax, unwind and enjoy the special days and nights with a honeymoon package in a lovely Victorian Bed and Breakfast along the Maine Coast. Make the kind of memories that will last a lifetime, touring the coast’s dramatic lighthouses, a lobster dinner in little-known coastal getaway, or shopping at over 160 stores and restaurants in Freeport, home of L.L. Bean. Indulge your romantic dreams at Brewster House. Arrive to a chilled bottle of Champagne, enjoy a full, hot breakfast each morning, made with the freshest available ingredients, fresh ground coffee or a large selection of teas, and home-baked scones, muffins or breads. Relax in one of our immaculately appointed spacious rooms with either King or Queen beds and large private baths. Unwind by touring L.L. Bean and the other shops, visiting the coastal sights, and little hideaways. The gifts above are included at your standard room rate, based on the season of your visit. Please request the Honeymoon Package when you reserve your room. Discounted gift certificates may not be used with this package. Specials and discounts do not apply to packages.